You know how the race to the finish feels. August/early September felt like trying to make it across a half-marathon finish line. 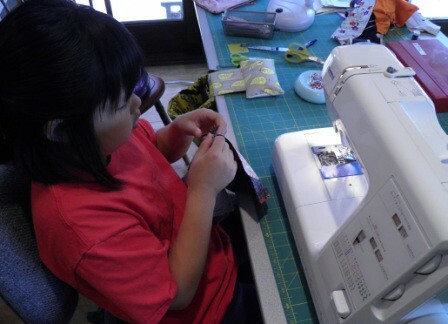 Kids Sew camps, private lessons, blogging, babysitting my DGD, planting, harvesting, designing new projects, a short vacation with my DH, and plenty more. Calgon, take me away! September always seems like a mini-new-year to me. New schedules, students, cooler evenings, yearning for soups and stews, yarn that wants to become knitted, coats and jackets calling out to be made. Finally, life is starting to take shape around here. The new shape of fall. One of my new students this fall is young (8), and oh-so-enthusiastic. It is amazing what kids can accomplish with focus, interest, and a little direction. 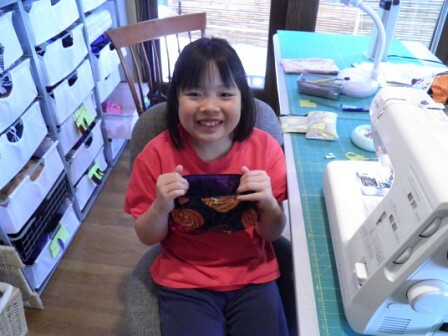 A completed zippered bag of Halloween theme fabric – all ready for pencils or any other small treasures. Nice work, Malia! Welcome fall, new students, and another new beginning.